A tough white covering called the sclera protects the eye. Part of the white sclera can be seen in the front of the eye. A clear, delicate membrane called the conjunctiva covers the sclera. At the front of the eye is the cornea. The cornea is the clear part of the eye’s protective covering. It allows light to enter the eye. The iris is the colored part of the eye that contracts and expands so the pupil can let just the right amount of light into the eye. The light is directed by the pupil to the lens. 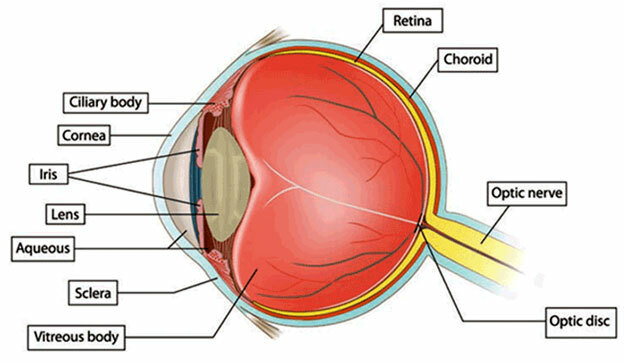 The lens focuses the light onto the retina (lining the back of the eye). Nerve fibers in the retina carry images to the brain through the optic nerve. The front part of the eye is filled with a clear fluid called intraocular fluid or aqueous humor, made by the ciliary body. The fluid flows out through the pupil. It is then absorbed into the bloodstream through the eye’s drainage system. This drainage system is a meshwork of drainage canals around the outer edge of the iris. Proper drainage helps keep eye pressure at a normal level. The production, flow, and drainage of this fluid is an active continuous process that is needed for the health of the eye. The inner pressure of the eye (intraocular pressure or IOP) depends upon the amount of fluid in the eye. 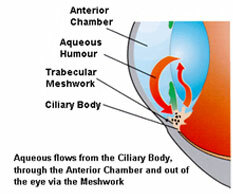 If your eye’s drainage system is working properly then fluid can drain out and prevent a buildup. Likewise, if your eye’s fluid system is working properly, then the right amount of fluid will be produced for a healthy eye. Your IOP can vary at different times of the day, but it normally stays within a range that the eye can handle. sensitive optic nerve and results in vision loss. You have millions of nerve fibers that run from your retina to the optic nerve. These fibers meet at the optic disc. As fluid pressure within your eye increases, it damages these sensitive nerve fibers and they begin to die. As they die, the disc begins to hollow and develops a cupped or curved shape. If the pressure remains too high for too long, the extra pressure can damage the optic nerve and result in vision loss. It was once thought that high intraocular pressure (IOP) was the main cause of this optic nerve damage. Although IOP is clearly a risk factor, we now know that other factors must be involved because people with “normal” IOP can experience vision loss from glaucoma. Aqueous humor is the clear, watery fluid that is continually produced inside the eye. It is different from your tears. Tears are produced by glands outside of the eye and moisten the outer surface of the eyeball. Glaucoma is a condition which can affect sight, usually due to build up of pressure within the eye. The eye ball contains a fluid called aqueous humour which is constantly produced by the eye, with any excess drained though tubes. 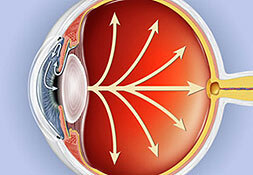 Glaucoma develops when the fluid cannot drain properly and pressure builds up, known as the intraocular pressure. This can damage the optic nerve (which connects the eye to the brain) and the nerve fibres from the retina (the light-sensitive nerve tissue that lines the back of the eye).